Our primary goal in collecting personally identifiable information is to provide you with a smooth, efficient and customized experience. The Personal Information is used for two general purposes: to process your order, and to provide you with the best possible services. This allows us to provide services and features that are most likely to meet your needs, and to customize the Website/Mobile Application and our Services to make your experience easier. As a matter of policy, we do not sell or rent any Personally Information about you to any third party. However, the following describes some of the ways that your Personally Information may be disclosed. Advertisers: We may aggregate (gather data across all Users) Personal Information and disclose such information in a non-personally identifiable manner to advertisers and other third parties for other marketing and promotional purposes. However, in these situations, we do not disclose to these entities any information that could be used to identify you personally. Other Corporate Entities: We may sometimes share data with our affiliates, subsidiaries, joint ventures and third party service providers that provide us with services and/or provide you with services. We use third-party service providers to process purchases you make and to monitor our Users' interests. To the extent that these entities have access to your Personal Information, we will ask them to treat it at least as protectively as they treat personally identifiable information they obtain from their other users or members. Our affiliates, subsidiaries, and joint ventures will follow privacy practices no less protective of all users and members than our practices described in this document, to the extent allowed by applicable law. It is possible that Vinacircle, its subsidiaries, affiliates, joint ventures or any combination of such, could merge with or be acquired by another business entity. 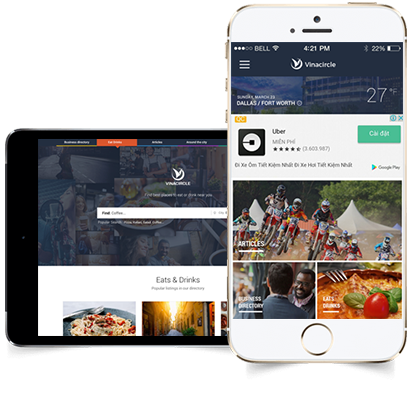 Should such a combination occur, you should expect that Vinacircle would share some or all of your Personal Information in order to continue to maintain and provide access to the Website/Mobile Application. Legal Requests: Vinacircle co-operates with law enforcement inquiries, as well as other third parties to enforce laws relating to matters, such as intellectual property rights, fraud and other rights. We can (and you authorize us to) disclose any Personal Information about you to law enforcement and other government officials as we, in our sole discretion, believe reasonably necessary or appropriate, in connection with any investigation. We will retain data for as long as you use the Mobile Application and it would continue for a reasonable time thereafter. Please note that some or all of the provided data may be required in order for the Mobile Application to function properly. If you wish to stop us from collecting any personal Information or other data, you may uninstall the Mobile Application. The Personal Information that we collect from you may be transferred to and stored at locations that are outside the territory of USA. It may also be processed by staff operating outside the territory of USA, who work for or are engaged by Vinacircle. Since the transmission of any information across the internet is not completely secure, we have implemented strong security measures and will do our best to protect your Personal Information. That being said, we cannot ensure 100% security and any transmission is at your own risk. Vinacircle gives you the ability to edit your Personal Information and preferences at any time. You have the right to refuse any marketing email from us in the future. To protect your privacy and security, we will also take reasonable steps to verify your identity before granting access or making corrections. We will, however, retain in our files and databases Personal Information you have requested to remove in order to use it in some circumstances, such as to resolve disputes, troubleshoot problems, and enforce our Terms and Conditions of Use. Further, such prior Personal Information is never completely removed from our databases due to technical and legal constraints, including stored "back up" systems. Therefore, you should not expect that all of your Personal Information will be completely removed from our databases in response to your requests. By using the Website/ Mobile Application and by providing your information, you consent to the collection and use of the information in accordance with this Policy, including your consent to share the information. Cookies are small and unique information identifiers that we send to your computer, mobile, tablet or other devices when you visit the Website. This enables us to recognize your profile and your device on future visits and provide to you customized features. These identifiers assist us in remembering your preferences and chosen items, hence, enhancing your Website browsing experience and trying to ensure that the ads and offers you see are personalized to your shopping behavior. The Website also uses technologies like Google Analytics which works on the data collected and stored through cookies and other identifiers for marketing and site optimization purposes. The acceptance of cookies is not mandatory for visiting the Website. Nevertheless, we would like to point out that many of the Website's features and functionalities are only possible with the activation of cookies. The Help menu on the menu bar of most browsers will tell you how to prevent your browser from accepting new cookies, how to have the browser notify you when you receive a new cookie and how to disable cookies altogether. If you do leave cookies turned on, be sure to sign off when you finish using a shared computer. We use encryption and authentication tools to protect the security of personal information that you share with us. However, no security system is impenetrable; no data transmission over the Internet (or, with respect to our mobile services, over cellular phone networks) can be guaranteed to be 100% secure. As a result, while we strive to protect personal information, we cannot and do not guarantee or warrant the security of our database, any information you transmit to or from the Site, nor can we guarantee that the transmission of the information to or from our Site will not be intercepted. You do so at your own risk.